So you’re building your own iOS Tinder Clone in Swift by using our premium Swift Dating Template. In this Swift tutorial we are going to describe, step by step, how you can get your MVP up and running in only a few minutes. If you already have experience with Firebase, feel free to skip to the interesting parts. On a high-level, you need to run the app in Xcode, override the Firebase .plist configuration file with your own, create a few dating profiles within the app and have the app uploaded to the App Store. Let’s get started. If you’re an expert, you can just install the pods and open the .xcworkspace in Xcode. If you’re a newbie like many of us, follow our detailed tutorial on how to do it step by step. Again, if you’re an expert, just replace the GoogleService-Info.plist file with your own. Click here for a detailed tutorial on how to complete this step by step. Low-level infrastructure: Networking, pagination, Firebase connection, push notifications, etc. Generic user interfaces: Chatting, Navigation, User Profiles, UI Extensions, User Onboarding, etc. Generic Dating components: Models, Data Source protocols, Swipe Managers, etc. DatingUIConfiguration – this is the bread and butter of your UI. It defines the main colors, fonts, tab bar appearance, and navigation bar appearance of your app. 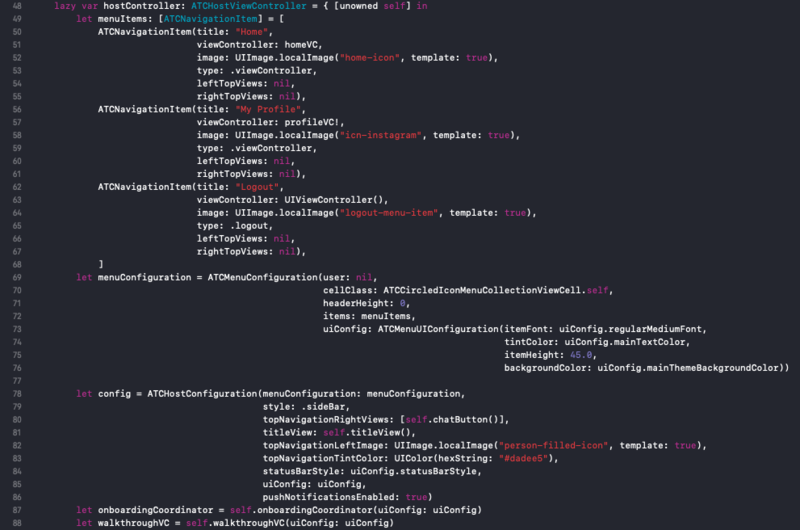 This is the file to modify to change the app theme. AppDelegate.swift – This is the entry point of your app, and it’s in charge of creating all of the configuration objects. DatingHostViewController – This class is the main view controller of the entire app and it manages & coordinates the displaying of all the screens: Walkthrough, Login, Sign Up, Side Menu, Tab Bar, etc. It hosts all the view controllers of your app. Notice how it’s using the powerful ATCHostViewController, which is our Core view controller, used on all of our Xcode templates. Change the ATCHostConfiguration object, if you want to modify navigation icons, tabs, menu style (tabs vs. drawer), top navigation buttons, tab titles, menu spacing, etc. DatingFeedViewController – This is the class that’s your home screen. It used KolodaView for Tinder-like card swiping. Notice how it’s using swipeManager to record the swipes into Firebase. DatingAddProfilePhotoViewController – The class where users can upload their profile photo, after account creation. ATCDatingAccountDetailsViewController – This is the screen where users complete their profile, with information such as age, gender, bio, school, first name, last name, etc. ATCDatingFeedMockDataSource – In case you decide not to use Firebase (by disabling it in the configuration file), the app will automatically use this mock static data. You can hardcode all the complete dating profiles, with photos, names, gender, etc. in this place. ATCDatingFirebaseSwipeManager – This component records all the swipes in Firebase (likes, super likes and dislikes). It just writes to the “swipes” table. It also exposes an API (checkIfPositiveSwipeExists) that returns whether there is a mutual swipe, based on which, the matching is done. ATCProfileFirebaseUpdater – As the name denotes, this class contains the utility methods of updating a user’s profile. It has support for uploading photos (to Firebase Storage) as well as updating the profile picture URL in the “users” Firebase collection. ATCDatingChatHomeViewController – this is the main screen displaying the matches (in the Stories tray) and the recent messages with the matches. It is a sub-app in itself since we are using our generic chat components (also used in the Chat app template). To make UI changes, you can just modify the ATCChatUIConfiguration object. ATCChatThreadViewController – this is a 1-1 chat room. It handles the bubbles UI as well as retrieving and writing messages data to/from Firebase. It also uploads images to Firebase Storage, when you’re sharing a photo via chat. It leverages MessageKit (which is an open-source framework, installed via Pods) for the bubble UI part. ATCPushNotificationSender – Class that’s responsible for sending out push notifications (e.g. when new matches happen, when messages are received, etc.) Make sure you update this class with your own server key, from your own Firebase account. 4.1. How do I customize the Walkthrough screens? In ATCWalkthroughStore, change the content of the walkthroughs array as you’d like. Each ATCWalkthroughModel represents a walkthrough screen, so you can add/remove screens, and modify the title, subtitle, and icons of the existing screens. The colors are being specified in DatingUIConfiguration. 4.2. How do I customize the Login, Sign Up and Landing screens? 4.3. How do I customize the Dating App Splash Screen? 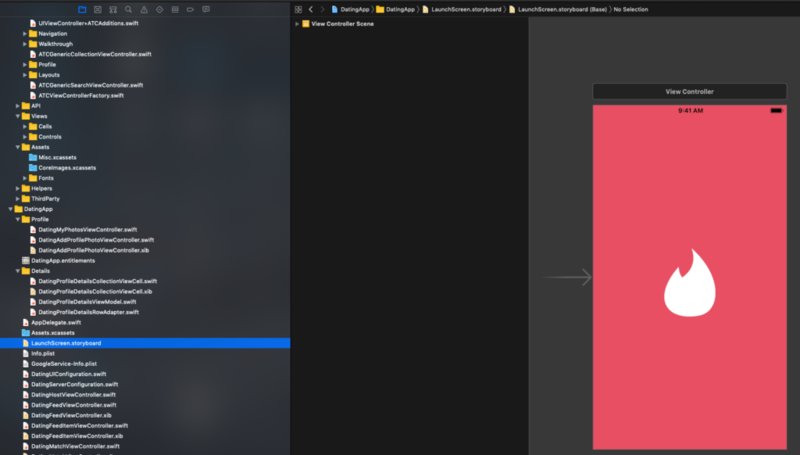 Just open the LaunchScreen.storyboard file and make drag-and-drop changes in Interface Builder (Xcode’s visual editor). If you followed our tutorial and you still have questions on how to make awesome customizations to your Tinder Clone for iOS, don’t hesitate to shoot us an e-mail. We’d love to add more useful information to this comprehensive documentation.